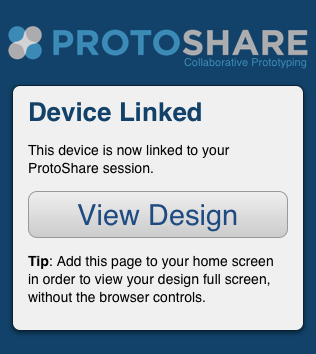 Follow the steps in the dialog to load the design on your device. The easiest way to get the URL onto your mobile device is to scan the graphical code with your device’s camera. If your mobile device does not support these codes, you will have to do it manually by typing in the URL and entering the PIN. After following these steps, your session will be automatically synchronized, and a link will be displayed that will load the active Design on your mobile device. Note: For convenience, it is useful to bookmark this page on your mobile device. This page will be the same for all of your Projects. Saving this page to your mobile device’s home screen provides quick way to link your Designs, and allows you to view them full-screen, with no browser controls (on supported platforms). Once you are viewing the Design on your device, you can interact with, and navigate around the prototype as usual. If you need to refresh the Design on your mobile device after making a change in the editor, simply use the mobile browser’s refresh action. If you want to view a different design on your mobile device, simply choose Run on Device again and enter the new PIN.